The Internet is a maze of information. Each day, if you are doing research on American history or family genealogy, research becomes more a matter of separating valid information from the mass of possible “hits” when using a search engine. Once you find a good site, connecting links help you navigate to find what you want. Helping you find the way is the reason for this page. What follows are suggested sites — outside of our hundreds of pages available at this website of the Joseph Bucklin Society — that are potentially helpful to you, or to which you may want to pay special attention. We offer them, with no particular organization, as being of some help to the intermediate to expert researcher who wants some interesting places to browse for American History, Revolutionary War information, Colonial Rhode Island History or connecting to the Bucklin Family Genealogy. If you are a Bucklin, then Rhode Island is a place that you should visit in your lifetime. The history goes back to when the first permanent settlement was founded at Providence, 1636, by Roger Williams, who was exiled from the Massachusetts Bay Colony. Early it attracted Quaker and Jewish immigrants seeking freedom of worship, who in the 1650s-60s became important parts of the accepted society. Quaker houses of worship and the first Jewish temple in North American are in available to visit. The colony was the first to formally renounce all allegiance to King George III, (May 4, 1776) but initially was opposed to the Union, and was the last of the 13 colonies to ratify the Constitution (1790) — so the state is proud of its history, which is always just under the surface wherever you travel in the state. Research on site in Rhode Island is usually rewarding because the librarians are helpful, and the libraries have much that is not available unless you open dusty books or boxes. Anyone doing research on early Rhode Island history will find good materials at the Rhode Island Historical Society. The Rhode Island Historical Society is among the best museum and historic house institutions in the country. The society has full accreditation from the American Association of Museums, and although its funding is limited, the citizens of Rhode Island should take pride in their historical society’s commitment to excellence. Founded in 1822, the Rhode Island Historical Society is the nation’s fourth oldest state historical society. Its museum and library holdings include 25,000 artifacts, 150,000 printed volumes, over 350,000 images, and over 6,000 manuscript collections. The Society is dedicated to preserving and sharing materials from Rhode Island’s past, so that present and future generations can more fully comprehend their predecessors, their communities, and themselves. The first building devoted to the Society was designed by James C. Bucklin, who designed many Providence buildings. The Society’s ongoing historical journal is Rhode Island History. Today the Society is the steward of some 30,000 artifacts and 500,000 library items. The Society maintains its research library in Providence, Rhode Island. Without doubt, if you are interested in Rhode Island history, a stop at the Rhode Island Historical Society (RIHS) should be on your “must do” list. For more information about the RIHS, see their website at www.rihs.org. 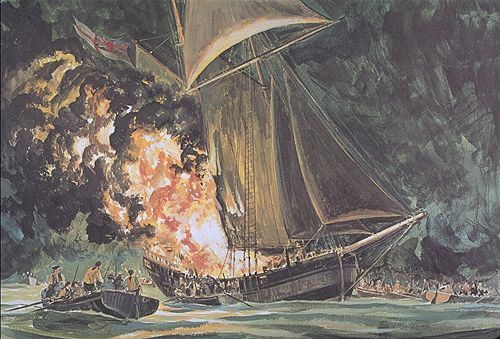 Persons writing about the Rhode Island 1772 attack on the English ship Gaspee usually wind up looking through materials available at this website — and one other: the Gaspee Virtual Archives. The Gaspee Virtual Archives are referenced several times in our site, because of the fine and energetic research work that webmaster John Concannon, M.D., does. Dr. Concannon’s work is also referenced in our separate website that deals exclusively with the Gaspee attack and the Rhode Island men who went on the attack that lead up to the American Revolution. At Gaspee Info, for example at the page on Dr. Mawney, we reference the Gaspee Virtual Archives because Concannon (himself a medical doctor) wrote the first real (although short) biography on Dr. Mawney. We cannot emphasize too strongly that he is the most energetic and committed researcher regarding “things Gaspee” we have had the pleasure of working with. Whenever you see a link from our site to his, you will find good information if you follow the cross reference link we provide. www.gaspee.com is the site of the Gaspee Days Committee, a dedicated (I’ve been to some of their meetings — they are dedicated!) nonprofit organization that runs a list of many varied community events commemorating the 1772 attack of the Gaspee, right off shore from their Pawtuxet community. This is the site to find out more about the famous Gaspee Days Parade each June. 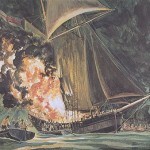 These Gaspee Com events are all designed to commemorate the burning of the hated British revenue schooner, HMS Gaspee, by Rhode Island patriots in 1772 as a proximate cause of the American Revolution. Chris Donnithorne, ex Royal Navy, who runs the www.navylist.org has good information about People, Places, Ships, Organizations and Events associated with the Royal Navy since 1660. U.S. History and The History Channel have extremely condensed Revolutionary War information that serves as background information for the Gaspee Affair. The information on their sites changes; what you see one month on a search for an item may not be there the next time you go back. Warwick, RI has a website that is a delight for those of you visiting there. Check their site, www.warwickri.gov, before you travel to Warwick to receive a background on what is there and what to do in the area. Warwick is just south of Providence and introduces gives you a transition from city to countryside.